Tuesday November 8th 1921 I was sewing what spare time I had. Was down to Fannies in the morning. We were all invited to Gibbs for supper. We spent a pleasant evening. Rained in PM. 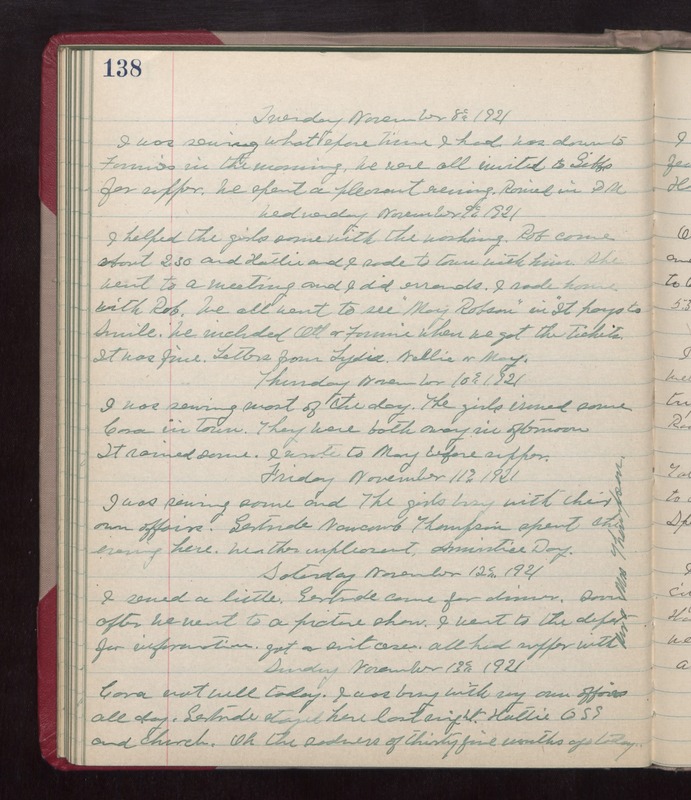 Wednesday November 9th 1921 I helped the girls some with the washing. Rob came about 2.30 and Hattie and I rode to town with him. She went to a meeting and I did errands. I rode home with Rob. We all went to see "May Robson" in "It pays to Smile." We included Ott & Fannie when we got the tickets. It was fine. Letters from Lydia, Nellie, and May. Thursday November 10th 1921 I was sewing most of the day. The girls ironed some. Cora in town. They were both away in afternoon. It rained some. I wrote to May before supper. Friday November 11th 1921 I was sewing some and The girls busy with their own affairs. Gertrude Newcomb Thompson spent the evening here. Weather unpleasant. Armistice Day. Saturday November 12th 1921 I sewed a little. Gertrude came for dinner. Soon after we went to a picture show. I went to the depot for information. Got a suit case. All had supper with Mr & Mrs Thompson. Sunday November 13th 1921 Cora not well today. I was busy with my own affairs all day. Gertrude stayed here last night. Hattie at S S and church. Oh the sadness of thirty-five months ago today.